Note: Shipping charge varies and billed separately. Pneumatic mechanism quickly adjusts height from seated to standing use. 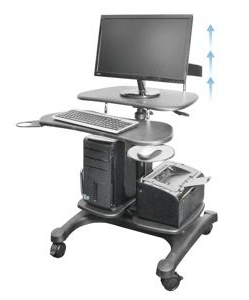 Large Platforms for Monitor and Keyboard, as well as a separate mouse pad and cup holder. Shelves for CPU and Printer, as well as UPS Battery Backup or Surge Protectors. 4 large locking casters for stability.